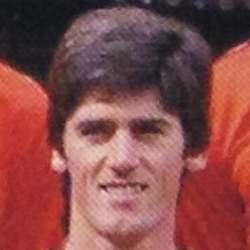 Alan was with Queen’s Park, Everton and then Crystal Palace, before signing for United. He was in the side frequently but hampered by injury he fell out of contention, and in August 1989 he was transfer listed. 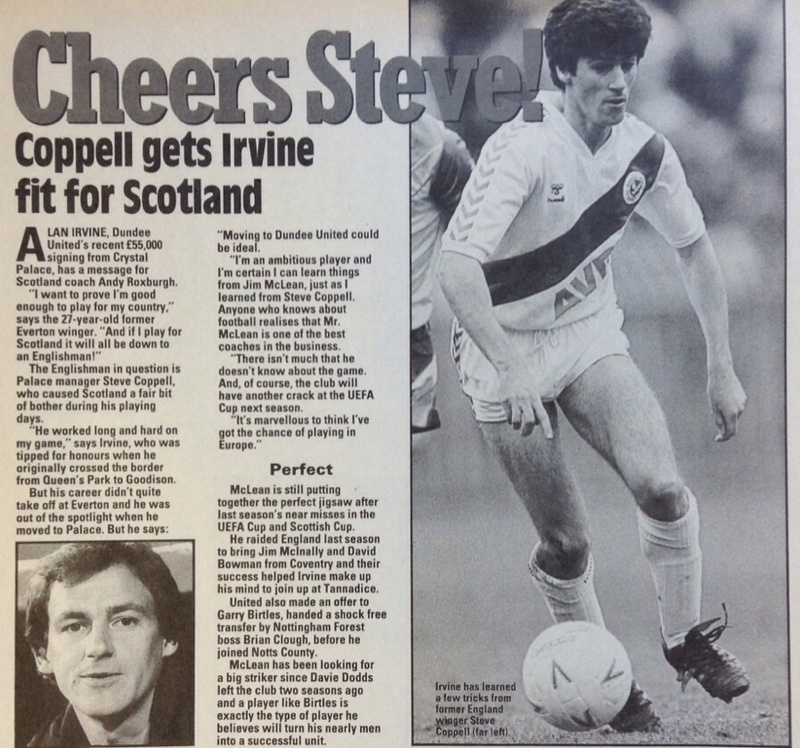 He went on loan to Blackburn Rovers, a move that became permanent for a fee of £30,000 in November 1989. J Alan was born on this date in Glasgow. Our record at Ibrox, which isn't as bad as most people think, should have been improved by even more than the point we gained here. 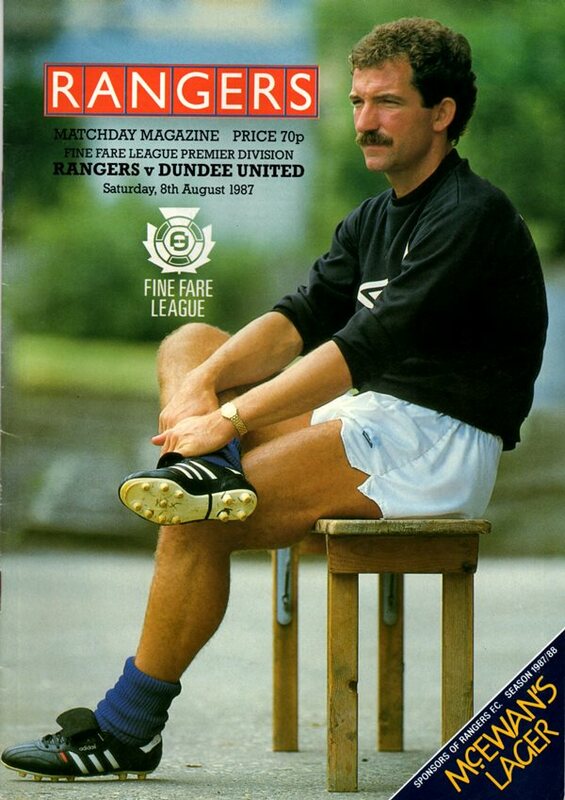 Facing a Rangers' team devoid of Butcher, Roberts and Souness, we took a stranglehold of the game in the first half. There was an early breakthrough. Eamonn Bannon deftly chipped the ball over the Ibrox defence, and Dave Beaumont ran through to take on Woods. His first effort was parried by the English internationalist, but Dave had an easy task to prod the loose ball into the empty net after 12 minutes. Ian Redford put Dave Bowman clear, but Dave shot straight at Woods. The only moment of concern to the Tannadice defence in the first half came in the 38th minute, but Dave Narey was on the spot to clear an Ally McCoist shot off the line. Our quickly improving form and confidence meant we soon established a stranglehold on this tie. After an even opening quarter of an hour, we made the breakthrough. Hamish French won the ball deep in his own half, passed to Alan Irvine who found Ian Redford just inside his own half but with a clear run in on goal. He advanced to the penalty box before despatching the ball past Jackson. On the half hour mark skipper Maurice Malpas ran on to a ball and beat Arbroath's off-side trap and neatly beat the advancing Jackson. Our third goal also stemmed from a ball which beat the home defence's off-side trap. Alan Irvine ran on to a ball chipped over the defence and crossed from near the bye-line for Mixu Paatelainen to knock home at the far post. We maintained our excellent record at Easter Road with this win, which none-the-less confirmed that Hibs would join us in next season's UEFA Cup. The game got off to an explosive start. Paul Hegarty found Maurice Malpas on the left and his cross was missed by the entire Hibs defence and Charlie Adam, but not Alan Irvine who tucked the ball under Andy Goram. Hibs immediately launched an onslaught on our goal. Dave Narey cleared a Houchen header off the line and the former Coventry striker headed just over, but Hibs gained reward in the 29th minute, when Houchen slipped the ball to George McCluskey, who drove the ball high past Billy Thomson. We quickly regained the initiative and Goram blocked a Kevin Gallacher drive and then an Adam overhead kick shaved the top of the bar. Our home League programme opened as disappointingly as it had ended last season as Motherwell fully earned the point which they took from this opening day fixture. Indeed this was the third consecutive 1-1 draw between Motherwell and ourselves at Tannadice. Yet we started well enough by taking the lead after only eight minutes. A piece of wizardry by Paddy Connolly left two visiting defenders in his wake and his cut-back from one byeline was turned home by Hamish French via the far post. By rights Motherwell should have equalised almost immediately. Gordon Mair raced clear and though Scott Thomson blocked his shot the ball bounced high in the air and fell to Steve Kirk, who somehow contrived to shoot over the bar with the goal at his mercy. A near let-off for Mothewell preceded their equaliser. Paddy Connolly sprinted wide left cut inside and shot, and the 'Well defence cleared the ball not only to safety, but to counter-attack. Bobby Russell swung over a cross from the right which Nick Cusack dived to head into the corner of the goal. Two minutes from half-time Freddy Van Der Hoorn hammered in a shot which Maxwell couldn't hold, but a Motherwell defender denied the incoming Mixu Paatelainen.